Patrick Conner (UGA), Elina Convea (Auburn), Cain Hickey (UGA), Phillip Brannen (UGA), Hannah Burrack (NC State University), Penelope Perkins (NC State University) and Robin Chilton (USDA). 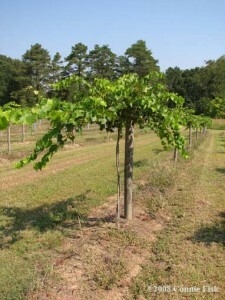 We have covered a broad spectrum of issues on muscadine production and fruit grading. The outreach presentations can be found at the end of this post. In the afternoon, a grading outbrake group and an extension team building effort took place. More than 40 people have attended, most of whom stayed for both, the education part and the team building part. Thank you so much for all you do! Please find attached the presentations and the list of extension goals (as established at the meeting) in pdf format. I want to thank everyone again for attending and the incredible help and input! Special thanks to Bruce McLean from Bladen County and Denise Bridgers, Ron Taylor and the whole Lu Mil Vineyards Team for helping and doing an incredible job!!! Thank you very much.